Reducing congestion by allowing part-time shoulder use allows for greater headways between vehicles and reduces stop-start activity that is generally known to contribute to rear-end crashes. However, implementation of part-time shoulder use requires a compromise of other geometric design elements, including shoulder width (when the shoulder is open to traffic) and sometimes others such as lane width and lateral offset to obstructions such as median barriers, guardrails, and bridge rails. Although limited research is currently available to quantify the specific effects of part-time shoulder use, the relationship between these variables and crash frequency provides insight into the potential safety effects of part-time shoulder uses. The following sections draw on the best quantitative tools available and reference empirical studies in an effort to inform evaluations of future implementation.The first section of this chapter describes a general process for assessing the safety impacts of part-time shoulder use on a given facility. Subsequent sections present findings from past before/after safety studies of part-time shoulder use and crash prediction methods, both of which can be incorporated into the analysis of a specific facility. Assessment of the safety impacts of part-time shoulder use on a given facility should begin with a review of three or more years of historical crash data. The review should consider the crash type, temporal factors (e.g., time of day, day of week), and location. Congestion-related crashes, such as rear-ends occurring during times the shoulder would be open, may potentially be reduced with part-time shoulder uses if congestion is reduced. Crashes related to erratic driver behavior or suboptimal geometry, such as run-off-road, fixed-object, or sideswipe crashes, may increase with part-time shoulder use. Crashes related to right-side ramp-freeway junctions may increase with right part-time shoulder use. The mere presence of crash types that may increase with part- time shoulder use should not prevent the application of part-time shoulder use, but a preponderance of those crash types indicates a given freeway may be a poor candidate for part- time shoulder use. The design of ramps and interchanges also informs the potential safety impacts of part-time shoulder use. There may be safety issues associated with on-ramps with high convergence angles, small merge areas, weaving sections, and other characteristics of older freeways. Two- lane on- and off-ramps may also introduce safety issues. Additional information on the design of part-time shoulder use at ramp-freeway junctions is in the Geometric Design section of Chapter 7. The Crash Prediction section of this chapter provides additional guidance on quantitatively assessing how implementing part-time shoulder use (and modifying freeway cross-section) influences crashes. Experience in the U.S. to date has not identified major safety issues with bus, static, or dynamic part-time shoulder use that led implementing agencies to discontinue their use. However, few empirical studies have been conducted to evaluate the specific changes in crash frequency and severity as a result of implementing part-time shoulder use. Crash frequency has increased following some part-time shoulder use projects and decreased following others, suggesting the safety impact of part-time shoulder use is influenced by site-specific operational and geometric conditions. The results of empirical studies appear to be heavily influenced by operational and geometric conditions. The following sections summarize the most reliable studies that have evaluated crash history associated with part-time shoulder use. A Federal Highway Administration (FHWA) Study used Empirical Bayes analysis to conduct a before/after comparison of I-35W in Minneapolis. (28) The Empirical Bayes analysis of total annual crash rates (at all times of day) on I-35W in Minnesota showed a 28.4-percent increase in crashes after implementation of a priced dynamic part-time shoulder use. MnDOT indicated the increase in crashes on I-35W after implementation was partially related to the removal of an upstream bottleneck around the same time shoulder running was introduced, effectively increasing congestion on the segment with part-time shoulder use. SHRP 2 Project L07 related crash data to speed, volume, and density data from Seattle and Minneapolis/St. Paul. Density was identified as the independent variable. The SHRP 2 model indicates a non-linear increase in crashes as density increases, particularly at level-of-service (LOS) D or greater. Researchers applied the SHRP 2 L07 models to I-35W in Minneapolis, which indicated an increase in crash frequency of 22 percent could be expected with the increase in congestion experienced on I-35W. Therefore, the researchers related the I-35W Empirical Bayes analysis to the SHRP 2 L07 model prediction to indicate as little as 6.4 percent of the increase in crashes observed on I-35W could be related to the part-time shoulder use. Kononov developed safety performance functions for freeways using data from Colorado and other states. (30, 31) Although the research did not specifically address part-time shoulder use, the findings have applications to the evaluation of other potential projects. On uncongested freeway segments, Kononov observed crash frequency increases only modestly as traffic increases until a critical traffic density is reached. Beyond this critical density, crash frequency increases much faster as traffic increases. When a lane is added to a freeway, there is a safety improvement due to the decreased density. However, if volume increases over time there is an increase in crash frequency. The additional lanes are able to process additional traffic, and Kononov also determined crash frequency increases more rapidly on freeways with more lanes. When considering part-time shoulder use, these findings suggest there will be a short-term crash reduction if part-time shoulder use decreases traffic density. If part-time shoulder use does not notably decrease traffic density [such as bus-on-shoulder (BOS) operation], then there may be no effect on crashes, or there may be an increase in crashes due to reduced shoulder widths, lane widths (if general purpose lanes were narrowed), and lateral clearances. The introduction of variable speed limits (without part-time shoulder use) decreased crashes per month from 5.08 to 3.17. The introduction of part-time shoulder use further reduced crashes per month from 3.17 to 2.25. (32) Variable speed limits are uncommon in the US at this time. In Europe, part-time shoulder use is almost always accompanied by the construction of turnouts and a higher level of ATM than is typical in the U.S., including dynamic speed limits/lane assignment, full CCTV monitoring, and aggressive incident management. The 2014 Supplement to the Highway Safety Manual (HSM), 1st Edition, provides a structured methodology and specialized procedures to estimate the expected average crash frequency for various freeway facilities. It does not, however, explicitly model part-time shoulder use. Shoulder width (left and right). The Enhanced Interchange Safety Analysis Tool (ISATe), developed by NCHRP Project 17-45, and the Interactive Highway Safety Design Model’s Crash Prediction Module apply the methods and models from the HSM freeway crash prediction chapters. These tools can be used to assess how changes to freeway cross-section influence crash frequency. The models reflect lane widths and shoulder widths and do not explicitly model shoulder use. Therefore, the predictive analysis assumes there is nothing inherent in a lane designated for part- time shoulder use that would change crash frequency relative to a general purpose lane of the same width, adjacent to a shoulder of the same width, on a freeway with the same AADT, and so forth. Models were developed with data collected on freeways with only full-time general purpose lanes. There is no differentiation between a general purpose lane and the shoulder, with all geometric dimensions being the same. Models do not capture changes to ramp-freeway junction areas that occur with part-time shoulder use. The HSM freeway model was calibrated only for right shoulder widths between 4 and 14 feet. When a shoulder is open to traffic, the resulting “shoulder” between the part-time travel area and the edge of pavement is usually less than 4 feet and the HSM cannot model this. Speed differential between vehicles in the shoulder and adjacent travel lane can vary depending on whether the shoulder is open to all traffic or restricted to specific users. Lane changes and weaving maneuvers associated with on- and off-ramps and speed- change lanes are not accounted for in the basic freeway analysis. They can be analyzed separately, but the separate models also lack an explicit means of accounting for part- time shoulder use. The HSM predicts crashes as a function of daily volumes and assumes a consistent cross- section throughout the day. Analyzing a shoulder in use for part of the day would require knowledge of the hours of operation and the percent of AADT during those hours. Models would be run twice, and a weighted average could be computed. The model will not account for the transfer of crashes from outside of the study area to within the study area, a phenomenon that has been observed if part-time shoulder use alleviates upstream bottlenecks. Improving freeway operation with part-time shoulder use may potentially transfer volume and crashes from adjacent alternate routes to the freeway. A slight increase in freeway crash frequency may accompany a larger decrease in network crash frequency. Despite these limitations, the HSM freeway models reflect trends related to freeway cross- section that provide insight into when part-time shoulder use may have a positive or negative impact on safety. The following sections present these trends. The HSM freeway crash prediction model can be used to assess the change in crash frequency and severity associated with increasing the number of freeway lanes while reducing shoulder width. This is the closest the HSM can come to modeling part-time shoulder use, although it only changes lane widths and shoulder widths, and does not explicitly model shoulder use. The scenarios presented below, then, must assume there is nothing inherent in a shoulder that would change crash frequency relative to a general purpose lane of the same width, adjacent to a shoulder of the same width, on a freeway with the same AADT, and so forth. Several example applications of the HSM models are provided to demonstrate their use. The combined change in total crash frequency associated with increasing the number of freeway lanes while reducing right shoulder width from 14 to 4 feet, which is the range of right shoulder widths for which the model was calibrated, is shown in Figure 16. 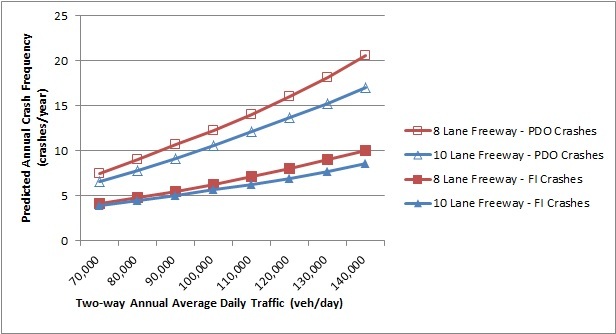 Figure 16 shows the safety effects of adding part-time shoulder use to 4-lane, 6-lane, and 8-lane freeways. The point at which each line crosses the 0% mark on the y-axis indicates the AADT threshold at which part-time shoulder uses would be expected to increase or decrease crash frequency. Figure 16. Graph. Predicted crash frequency associated with increasing number of freeway lanes and narrowing the right shoulder. Figure 16, like others in this section, assumes shoulder use is actually the addition of a full-time lane. This is not the case with part-time shoulder use, so crash frequency changes associated with part-time shoulder use would be a fraction of those depicted in Figure 16. The model predictions indicate that when congestion reaches a certain level (below the zero point on the y-axis in Figure 16), the crash reduction benefits of adding a lane are predicted to exceed the increase in crashes associated with reducing the width of the right shoulder. It is noted the AADT threshold for achieving a reduction in crash frequency for a 6- to 8-lane conversion is lower than that for an eight- to ten-lane conversion. This reflects the model prediction that an eight- to ten-lane conversion is expected to have a greater reduction in crashes than a six- to eight-lane conversion, as described in the Model Evaluation of Number of Freeway Lanes section below. Subsequent sections explore how number of lanes and shoulder width, individually without changing the number of lanes on the freeway, influence crash frequency and severity. Using the HSM freeway models, the relationship between predicted crash frequency associated with converting an eight-lane freeway to a ten-lane freeway at various level of AADT was assessed. This is analogous to a conventional widening project where shoulder width remains the same after the addition of a lane. Figure 17 illustrates the predicted number of Fatal and Injury (FI) crashes and Property Damage Only (PDO) crashes associated with converting an eight-lane freeway to a ten-lane freeway at various level of AADT, while lane widths, shoulder widths, and all other model variables are held constant at default values. Figure 17 indicates both FI and PDO crashes are expected to decrease with the conversion from an eight- to ten-lane freeway. Figure 17. Graph. 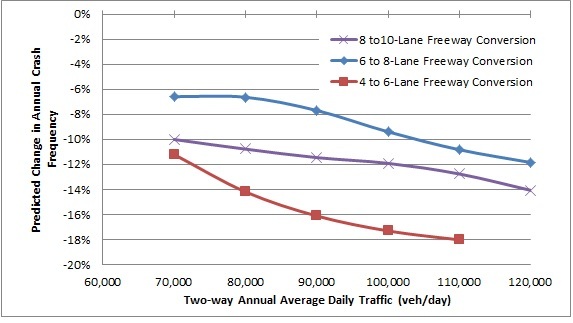 Predicted crash frequency on eight- and ten-lane freeways relative to Annual Average Daily Traffic, no change in shoulder width. 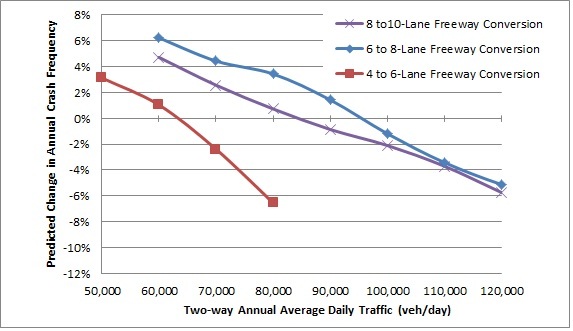 Figure 18 illustrates how total crash frequency is influenced by AADT and increasing the number of freeway lanes from four to six, six to eight, and eight to ten. Figure 18. Graph. 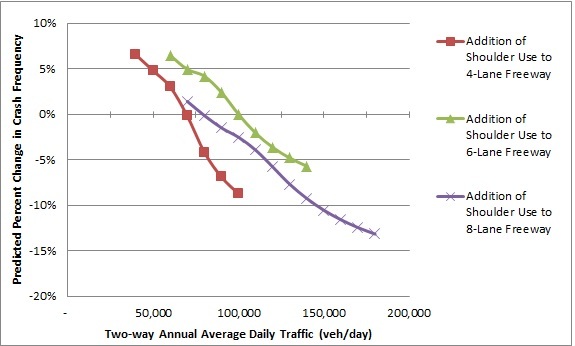 Predicted crash frequency relative to Annual Average Daily Traffic and Number of Freeway Lanes, no change in shoulder width. As shown in Figure 18, the HSM freeway models predict a greater reduction in crash frequency for a 4- to 6-lane conversion than for an 8- to 10-lane conversion. HSM freeway crash prediction models were applied to estimate the influence of reducing right shoulder width on 4-, 6-, and 8-lane freeways from 14 feet to the minimum model input of 4 feet, while holding all other model variables constant at default values. This isolates the effects of shoulder width from the effects of adding lanes. Figure 19 illustrates the predicted FI crash frequency associated with this change in right shoulder width on an 8-lane freeway. The trend is similar on 4- and 6-lane freeways. PDO crashes were omitted from Figure 19 because they are not sensitive to shoulder width in the 8-lane freeway model. The 4- and 6-lane freeway models predict slight increases in PDO crashes as right shoulder width decreases. Figure 19. Graph. 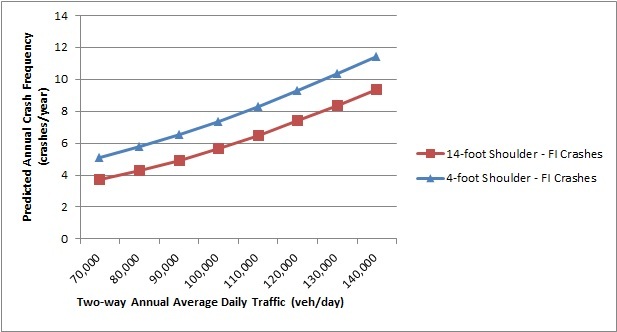 Predicted crash frequency on eight-lane freeways with 14- and 4-foot right shoulder width relative to Annual Average Daily Traffic. As shown in Figure 19, reducing the shoulder width from 14 to 4 feet (without adding a lane) is expected to increase FI crash frequency, assuming volumes and other variables are kept constant.This reinforces the previous finding that part-time shoulder use is most appropriate if it relieves congestion and thus reduces congestion-related crashes. Most projects involving the implementation of part-time shoulder use have not modified general purpose lanes. However, part-time shoulder use could be implemented by narrowing general purpose lanes and widening the shoulder to make it a more viable for travel. This section presents the predicted safety effects of this change for the specific scenarios shown in Table 6. The alternatives without part-time shoulder use reflect default values from the prediction models. The alternatives with part-time shoulder use assume width reductions from existing travel lanes and shoulders to provide for an 11-foot shoulder lane. Scenarios with part-time shoulder use are modeled with two more travel lanes (one per direction) than the existing freeway cross-section. Like the previous analysis presented in this chapter, the scenarios only changed lane widths and shoulder widths and did not explicitly model shoulder use. Table 6: Freeway part-time shoulder use scenarios and crash prediction inputs. Note: Part-time shoulder use is modeled as six 11′ general purpose lanes beside narrower shoulders, in use 24 hours a day. Figure 20 through Figure 22 illustrate the predicted frequency of Fatal and Injury (FI) Crashes and Property Damage Only Crashes (PDO) for each freeway alternative shown in Table 6. Note: Part-time shoulder use is modeled as six 11’ general purpose lanes beside narrower shoulders, in use 24 hours a day. Figure 20. Graph. Predicted crash frequency with and without narrow lanes and narrow shoulders on 4-lane freeways. Figure 21. Graph. Predicted crash frequency with and without narrow lanes and narrow shoulders on 6-lane freeways. Figure 22. Graph. Predicted crash frequency with and without narrow lanes and narrow shoulders on 8-lane freeways. The analysis modeled part-time shoulder use as narrow general purpose lanes beside narrow shoulders and not explicitly as shoulder use because the HSM models do not explicitly include lanes designated for part-time shoulder use. Figure 23 summarizes the scenarios shown in Table 6 and shows the safety effects of adding part-time shoulder use to 4-lane, 6-lane, and 8-lane freeways by narrowing general purpose lanes to 11 feet and reducing shoulder width. The point at which each line crosses the 0% mark on the y-axis indicates the AADT below which part-time shoulder use would be expected to increase crash frequency and above which part-time shoulder use would be expected to decrease crash frequency. Note: Part-time shoulder use is modeled as a reduction in general purpose lane width, addition of an 11′ general purpose lane, and reduction in shoulder width, in use 24 hours a day. Figure 23. Graph. Predicted percent change in crash frequency when adding part-time shoulder use by narrowing all lanes. An analysis of existing crash data, including crash type, time of day, and the location of crashes, should be the basis of a safety analysis of potential part-time shoulder use. Congestion-related crashes occurring during the hours part-time shoulder use would operate will likely be reduced by part-time shoulder use. Crashes related to erratic driver behavior, driver confusion, or suboptimal geometry may increase with part-time shoulder use. Secondarily, the figures provided in this chapter provide ranges of AADT when part-time shoulder use is expected to have a positive or negative effect on crash frequency. The empirical studies show that additional variables not specifically accounted for in the HSM prediction models could increase crashes associated with part-time shoulder use. Those factors include any differences between narrow general purpose lanes and a narrow part-time “lane” on a shoulder, speed differential, influence of ramps, and upstream/downstream bottlenecks. Changes in barrier offset difference with and without part-time shoulder use can be modeled in the HSM, but were not included in the analysis presented in this chapter because of high dependence on site-specific conditions. There may be greater changes in crash frequency with part-time shoulder use if barriers are present and they cannot be moved further back from the roadway when part-time shoulder use is implemented.